At MarijuanaFloor.com we strive to offer only the purest products with no additives. Koma vaping pre filled cartridges certainly deliver with this 100% Co2 oil. Using the RSO/Co2 extraction methods are used for the best results and lab tested to insure potency and purity, as well as to verify the profiles of all cannabinoids and terpenes. Koma marijuana concentrates provide the best and purest organic products for all your vaping needs. Stylishly and tastefully packed, these cartridges can give you all the benefits of a regular smoke plus a simple and effective way for the ardent smoker who wants to enjoy all the benefits of marijuana but doesn’t want the negatives which come from actually smoking. This make it a great method to quit those cigarettes once and for all. The easily replaceable cartridge contains 1 gram of Indica which has THC levels of approximately 72%, and CBD levels of 13%. As you’d expect from a Kush OG, the flavours are earthy and the hit from this vapor cartridge is potent and very satisfying without sacrificing any of the quality. The instant effects of this delivery method make it a far better way to consume marijuana if you wish to avoid the harsh effects of smoking. There are many medical benefits from using a vapor cartridge and this particular strain has shown to be effective against chronic pain and arthritis as well as nausea and muscle spasms. Sleeping disorders such as insomnia can also be tackled with this vapor cartridge strain. 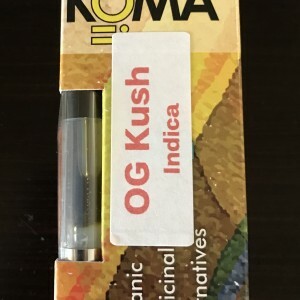 Buy High Quality and Original OG Kush Oil Cartridges Indica Hybrid Weed online at Marijuana Floor.